As gardening writer for the sumptuous magazine, Tasmanian Life, I am privileged to visit and interview Tasmania’s finest gardeners and wander in their gardens. I am ever in awe of their accomplishments. Here’s a glimpse of last weekend’s journey to the north. On Friday Tasmania was hot and filled with cricket. I phoned renowned rosarian Susan Irvine from Deloraine, as per my instructions. “Your timing is good,” she said. “Ponting just got out!” The last I had heard of Ponting’s score was the day before when he was not out for 143. Some 20 hours later he had only just gone, with over 200 runs! (background for the uninitiated: Ponting = captain of Australian cricket team, is a Tassie lad and it was Oz vs Pakistan in Hobart). That was the last word on cricket as I entered the genteel world of Forest Hall and its roses. Forest Hall has a blue roof, which is something I have always coveted. It is old and made of deep blocks of stone, a building that belongs in its landscape. Lovingly restored by Susan and Bill who came from Victoria in the mid-1990s, it is set in a classical parkland of oaks, elms, lindens and other gracious trees more than 100 years old. The backdrop for Susan’s rose obsession, which completes the English fantasy, was uninhabited, becoming derelict and seemed to be waiting for her to find it. So while Bill went fly fishing, Susan got planting. There are a lot of roses here. About 800 in fact. 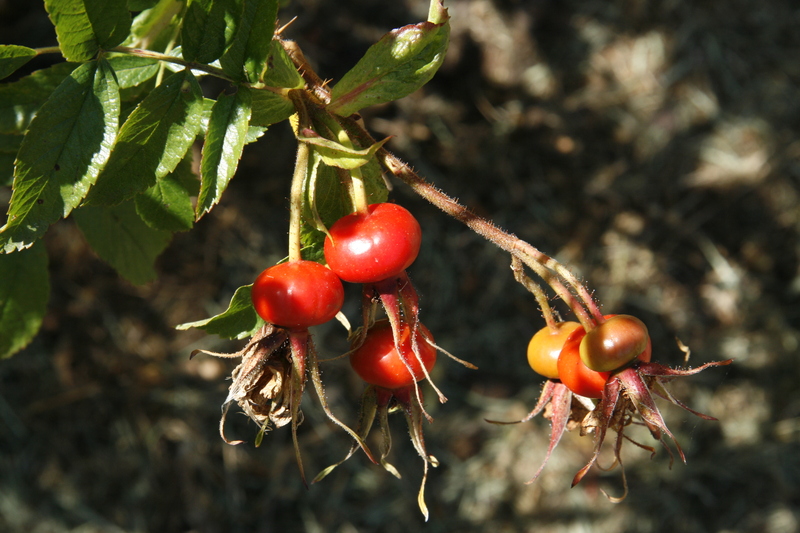 Many of them are species roses which means they have simple flowers, a spreading habit and gorgeous rose hips. 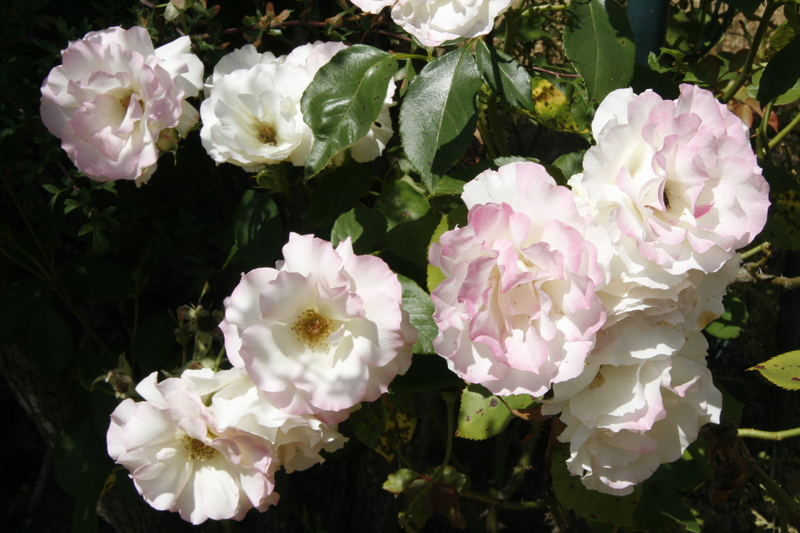 It is Susan’s mission to preserve both species roses and Alister Clarke roses. The latter are named after their breeder, another Australian passionate about the belle fleur. He took it upon himself to breed roses for Australian conditions, using Rosea gigantea, from Burma. European breeders had never used this stock as it was frost tender. Alister died in 1949 and his roses were lost to the public. Rosa gigantea had big babies and although the shrubs thrived in our wide brown land, they were too big for the average suburban block. Susan sought them out, saving them from obscurity. With many acres to play with, Susan has been able to plant an abundance of both species and Alister Clarke varieties. Unlike many modern roses, they don’t need much maintenance so a vast private collection is not a burden. 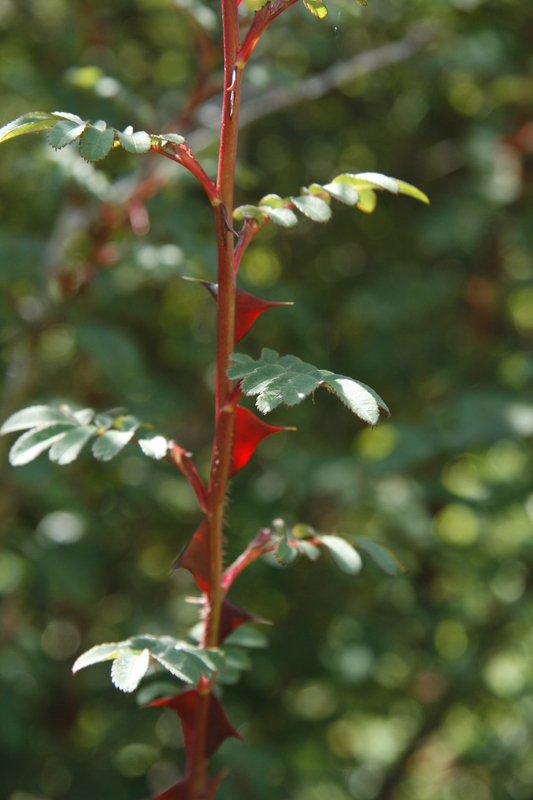 Wingthorn Rose - simple white flowers, wonderful thorns and great hips! I am out of time, though not out of tales to tell. For more on Susan and her flowers, keep tabs on Tasmanian Life as the full story will eventually be there with many more glorious pix. 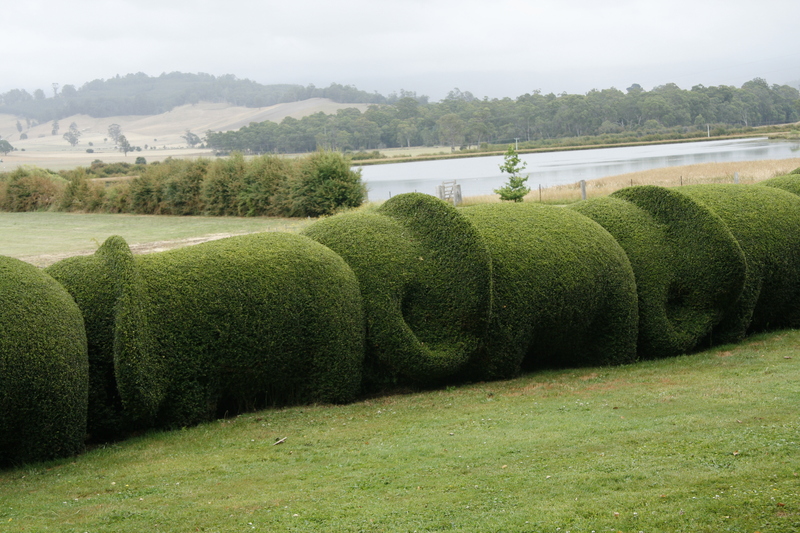 I have yet to fill you in on the baby elephant hedge pictured above (it’s not Susan’s) and my time with housewife extraordinarie, self-published author many times over, the one who crochets hats from plastic bread bags and mats from old stockings… she has a cult following, is going on 93 years old and is an inspiration to Barry Humphries and his friend Dame Edna – I am of course, refering to Tasmania’s Marjorie Bligh. 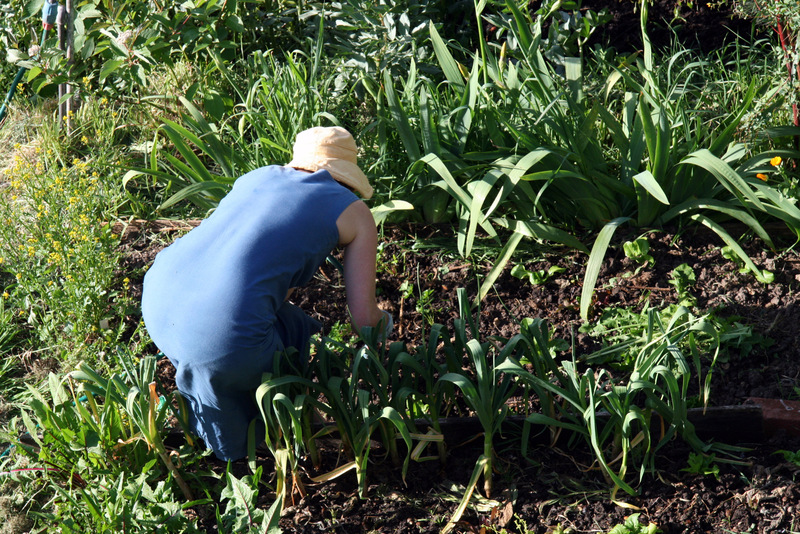 This is a very quick one to say welcome to Gardening with Helen. I have an actual deadline for an actual magazine article so I can’t write a proper blog just now. But as I just ‘launched’ the site by emailing many unsuspecting people in my address book, thought I’d better post a post. More in the next few days…Will report in next week about my Northern Tasmania tour to visit Susan Irvine and Marjorie Bligh. PS It’s 36 degrees in Hobart today, and the watering is under control.